On March 8, 2014, Malaysian Airlines Flight 370 took off from Kuala Lumpur International Airport for Beijing Capital International Airport. Less than an hour after taking off, the boeing 777-200ER last made contact with an air traffic control tower–and then vanished. With it vanished 227 passengers–the majority of them Chinese–and a crew of 12. By March 18, 26 nations were participating in the search. Not since the 1937 disappearance of aviatrix Amelia Earhart has the disappearance of a single plane triggered such an international frenzy. And that frenzy extends to the media coverage given it–especially on CNN. Since its disappearance on March 8, Flight 370 has been the preeminent story on CNN. With no telltale wreckage or even an oil slick to indicate the plane’s fate, CNN has been forced to make do with maps and “talking heads” speculation. And to keep audiences attuned while there is no actual news to report, CNN has been forced to rely on a steady stream of “BREAKING NEWS” headlines. And then what follows is more “talking heads” offering more speculation. On March 16, CNN anchor Don Lemon and Brad Meltzer, host of Brad Meltzer Decoded, raised the possibility of “the supernatural” as responsible for the disappearance. 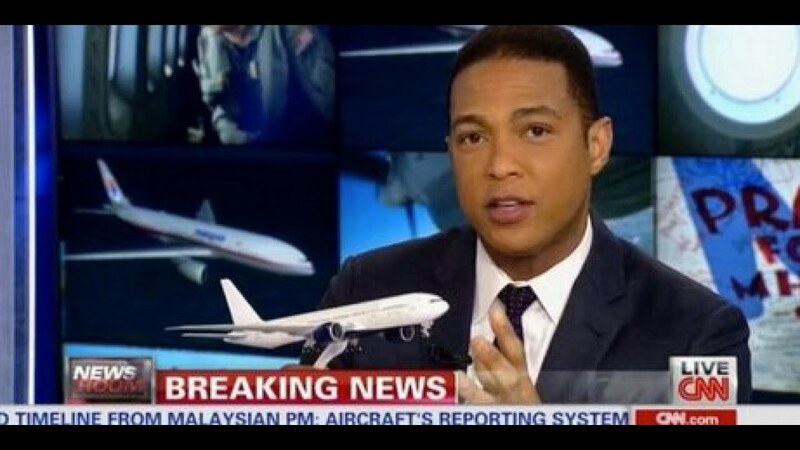 Lemon used a toy plane to demonstrate a series of turns and dives before simulating a landing on his anchor desk. And Meltzer responded: “People roll their eyes at conspiracy theories, but what conspiracy theories do is they ask the hardest, most outrageous questions sometimes, but every once in a while they’re right. This, in turn, has had both a positive and a negative effect. On the positive side: CNN–which has found itself struggling in the ratings war against Fox News and MSNBC–has seen its ratings surge. Over the weekend of March 15-16, CNN’s ratings soared, rising by almost 100% in prime time. On the negative side: CNN’s “All-Vanished-Plane/All-the-Time” coverage has annoyed and angered many other viewers–including some prominent ones. One of these is Bill O’Reilly, host of Fox News program The OReilly Factor. “There comes a point where it becomes a burlesque show, it becomes a farce and we’ve reached that point on this coverage,” O’Reilly said. Breaking News!” means “news that is happening right now.” It does not mean “news that happened last week but we just found out about it today.” Nor does it mean speculation about events that still remain a mystery. It is possible to broadcast more than one news story in a 24-hour period. The disappearance of the Malaysian plane does raise troubling questions about aviation safety. But there are other events going on in the world. And some of them are–surprise!–even more important. When you don’t have any actual news to report on a particular story, just say so and move on to another story where you do have news. Putting a half-dozen “talking heads” around a table to endlessly speculate about what might have happened isn’t the same as actually reporting the news. There’s nothing wrong with a network’s sticking with a story as long as (1) it’s truly important, and (2) it’s actually ongoing. The classic example of this: When, in August, 1991, the KGB and other Right-wingers overthrew Mikhail Gorbachev, General Secretary of the Soviet Union. Closely following this story–for reporters and viewers–made sense: The Soviet Union commanded enough nuclear weaponry to destroy the United States. So it truly mattered whether Gorbachev–a moderate reformer–remained in power or was replaced by a KGB-sponsored coup. Fortunately–for Gorbachev and the West–he was returned to power and Communism collapsed. Watching on TV as Russians throw off the yoke of 70 years of Red slavery was like watching the fall of the Roman Empire. This was a truly monumental and historical event. And those who lived through it as spectators could be grateful to CNN and other networks for their ongoing coverage. But the disappearance of a single Malaysian plane doesn’t fit into these categories. Even if it proves monumentally good for CNN’s ratings.